The subject of food and diet can be a confusing and sometimes frustrating topic. There are a lot of conflicting viewpoints and currently not enough research to prove certain theories about what we should eat and what to avoid. That being said, When it comes to acne and other inflammatory skin conditions, there is definitely evidence that certain dietary choices and habits can have an affect—for better or worse—on our skin. 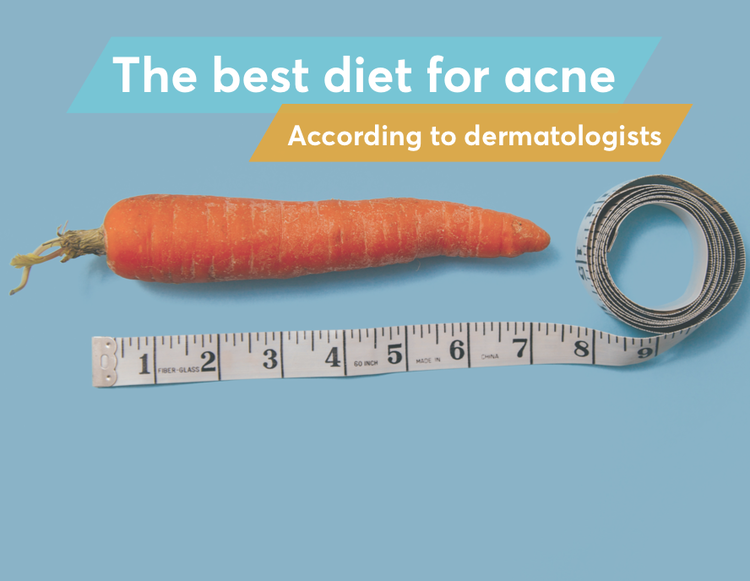 Given what we've seen in clinical research and from assessing thousands of acne patients, here are our dermatologist recommendations and insights for an acne-friendly diet. 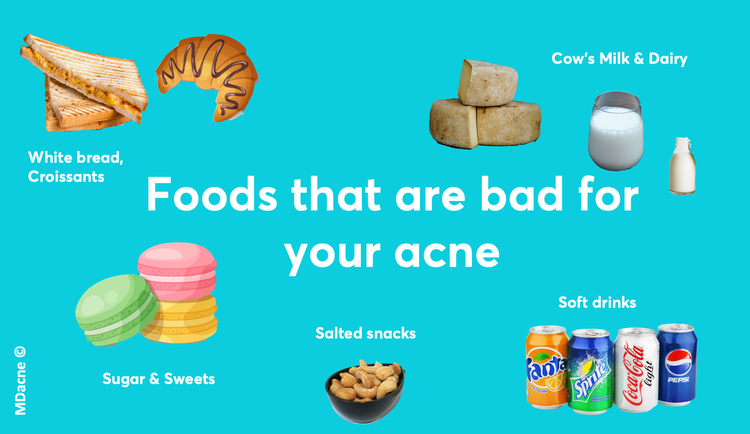 Which foods should you avoid when you have acne? 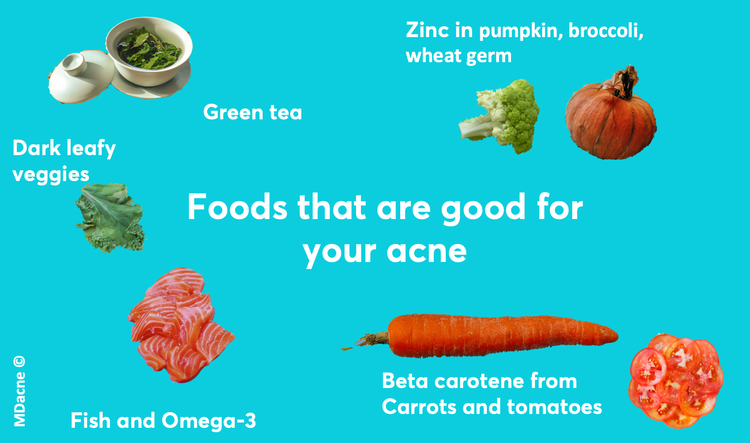 While we typically don't recommend cutting out entire food groups (or demonizing any particular food), there is research shows that certain dietary choices can trigger or exacerbate acne breakouts. One of the worst dietary skin offenders? Foods that spike blood glucose and insulin levels (i.e. sugar and foods that turn into sugar). When we consume what are known as "high glycemic" foods, our blood sugar level spikes. This spike triggers an increase in the growth hormones (IFG - insulin-like growth factor), leading to enlargement of the sebaceous glands, more sebum production, and ultimately, more acne breakouts. Therefore, foods with this effect should be monitored, limited, or removed altogether from the diet in people with acne-prone skin. Foods with a high glycemic index (GI). Why is dairy bad for your skin? Dairy products have been shown in multiple studies to increase levels of insulin-like growth factor 1 (IGF-1), which as explained above, can trigger or worsen acne breakouts. One of the most triggering forms of dairy is cow's milk, especially "low fat" milk which contains a large amount of progesterone-like hormones and has higher sugar content. A recent study, published in the Journal of the American Academy of Dermatology in March 2015 found that participants with acne consumed significantly more low fat/skim milk than those who didn't. Oil: Oil in the diet has not been shown to cause acne. Having said that, debris of greasy food around the mouth can cause more acne breakouts in this area by clogging the pores. Food that can help with your acne? While a good, balanced, low GI diet is the best place to start, there are certain supplements that can help as well, especially, Zinc, vitamin A and D.
Zinc is an essential mineral that contributes to skin hair and nails healthy, and help with immune system activity, protein, and DNA synthesis and wound healing. A few clinical studies have shown that oral zinc may help treat acne—especially adult acne and cystic acne. We can find significant amounts of zinc in seafood (oysters, crab, and lobster red meat), poultry, beans, nuts, and whole grains or as a food supplement. Vitamin A can help with the immune system, vision and the normal development of the skin cells. Vitamin A can be naturally found in beef liver, certain types of fish (herring, salmon, tuna), green vegetables (spinach and broccoli), orange and yellow vegetables (sweet potato, carrots, squash) or as a dietary supplement. What should you drink when you have acne? Drinking water (plenty!) is a must to stay healthy and energized. A and a small amount of coffee (without milk) is OK depending on how you tolerate caffeine. Teas, especially green tea are antioxidants and can be beneficial for both your general health and acne. The best acne for people with acne is ... actually pretty intuitive! It should be balanced between grass-fed protein, organic vegetables, and some, low-glycemic complex carbs. That said we should not forget that a good diet is just one factor in your way to clear skin. To clear acne completely it is critical to implement an effective, medical-grade acne treatment personalized to the individual's acne severity and skin type. To find the right topical treatments for your unique skin, take the free MDacn skin analysis here.